"A good lighting system should effectively light the dartboard evenly and eliminate any shadow a dart may cast across the scoring area." It has been a while since I updated this section and since I wrote it a lot has changed. 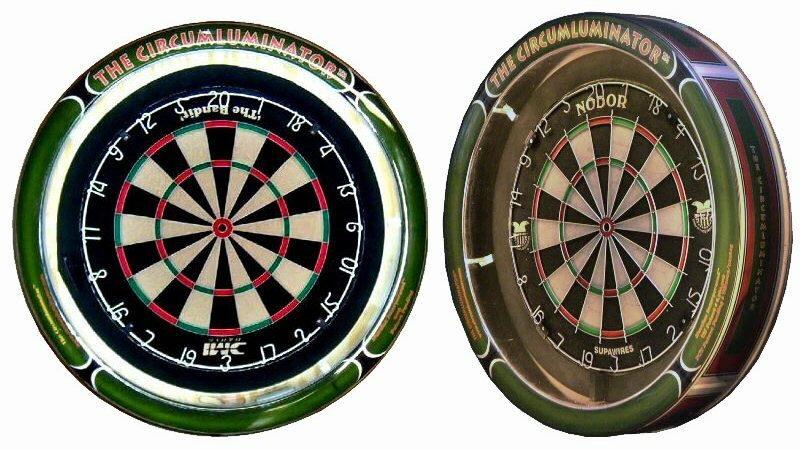 When I first wrote a page about dartboard lighting the big invention was the ‘Circumluminator’ back in 2005. It effectively eliminated shadow to give the dart player the best lit dartboard on the market. The board was lit by a circular tube light encased in a dart proof clear surround. The initial design I felt lacked in its finished construction. However, it was one of the first 25 to roll off the construction line and I believe one of the first to hit the UK shores. I gave my feedback to the inventor, Scott Harrison, he then reviewed the ‘Circumluminator’ and version two was an improvement. Scott reported back to say what had changed. "The lamp housing is now injection moulded of Lexan polycarbonate and is 5mm thick throughout. The slotted keyway for mounting the dartboard is substantially stronger and the plastic springs extending from the back of the lamp housing now hold the dartboard securely, preventing it from accidental rotation during play. The custom graphics displayed backlit on the radial face of The Circumluminator are now printed on heavyweight, glossy photo paper of much higher quality than the lightweight matte finish paper I used initially. Graphics are now standard design on the annular outside surface of The Circumluminator to prevent bright light from escaping from the periphery of The Circumluminator. The Foam ring which serves to fill the void between the Dartboard and the lamp housing is now die cut quarter circles which I glue securely together with a protruding handle glued to one of the joints for ease of removal. " The alternative to the ‘Circumluminator’ was the basic single spotlight preferably 100W or a trio of spotlights of less wattage 60W to light the board. Neither however eliminated dart shadow as per the ‘Circumluminator’. The top manufactures seemed not to take to the ‘circumluminator’ for reasons I do not know. Although you can customise the 'Circumluminator' with your own logo, team name etc which is backlit, the light has not been taken up widely in the UK. It had been some years since a rival came on the market and the first of these, I had seen was made by Target darts. It is called the Vision 360 Lighting System and features a halo of 125 LED lights to light the dartboard. Like the ‘Circumluminator,’ the lighting halo ring eliminates dart shadow and give an even light across the dartboard and has gained approval by the World Darts Federation (WDF). Target has since introduced an alternative version called the ‘Corona Vision Light’. The difference between these two lights is that the ‘Corona’ has a magnet attachment that allows the lighting system to be attached to the steel ring of the dartboard. Since ‘Target Darts’ has introduced the use of a LED light both Unicorn Dart and WInmau have followed suit. Again, both have adopted a similar approach with a ring of LED to light the dartboard. Unicorn currently has the Solar Flare a ring of light that sits at high round the playing surface of the dartboard. It is engineered to push fit over ‘any bristle dartboard’. Not sure if this only means any unicorn made dartboard or any dartboard on the market. But to be on the safe side I would suggest if you are looking to purchase this light that you keep the whole setup Unicorn. In addition, Unicorn has also made a Solar Flare Light surround ‘Solar Surround’. This does make the whole of the system look very professional but this does come at a hefty cost. Most may not have the opportunity of seeing all three of these dartboard lights together. Four if you add the ‘Circumluminator’ so it can be hard to judge what is the best for you. Although I may have initially criticised the ‘circumluminator’ for its quality of finish, it does do the job and does it well. It can be customised with your own club, pub or even favourite football team graphic or you can use the default ‘Circumluminator’ graphics. Unlike the newer competitors, it doesn’t protrude as far in front of the board and in my personal opinion, this doesn’t distract you from play. Installing a new light not only has its advantages of eliminating dart shadow all of these systems use less power. So, two great advantages. The only issue I have with the halo type lighting is they are big and sit high in front of the board. If you are a player that throws mainly from one side of the dartboard, I can see that the lighting systems could be a distraction as they can be within your eye line. That said it is probably a case of just getting used to this method of lighting as none will directly interfere play. None of these lighting systems is cheap so I suggest you gather information from the manufacturers directly. Should you be lucky enough to have a club or pub nearby that has installed one of these lights I again suggest you take a personal look at them and if possible, play a few games so you can make up your own opinion. Most dartboards are still lit by a single spotlight and are still likely to be lit this way for some time to come. If you feel the purpose-built dartboard lights are too expensive at the moment or you have seen them and think maybe they are not for you, how should you light the dartboard? If using a single spot lamp, make sure it is a bright one. If possible, fix this to a ceiling where you can adjust the angle of the light to give the best illumination you can from a single spotlight. You will find, however, that the light will cast a shadow from any dart in the dartboard, hence why the dart manufacturers have addressed this issue with their own lighting systems. A slightly better method is to have three (or more) spotlight to light up the dartboard. Using a staggered but even distribution of a few spotlights can reduce the dart shadow but won’t fully eliminate it as a 360-degree lighting system will. However, for most home uses, pubs and clubs this seems to be the least expensive and acceptable method of lighting the dartboard playing surface. Spotlights are commercially available from any good DIY shop and lighting suppliers. For the dartboard lighting rings most, good dart shops online dart suppliers will sell them. This light from Holland uses traditional two spotlight setup however in this case the spots are again low voltage LED’s. 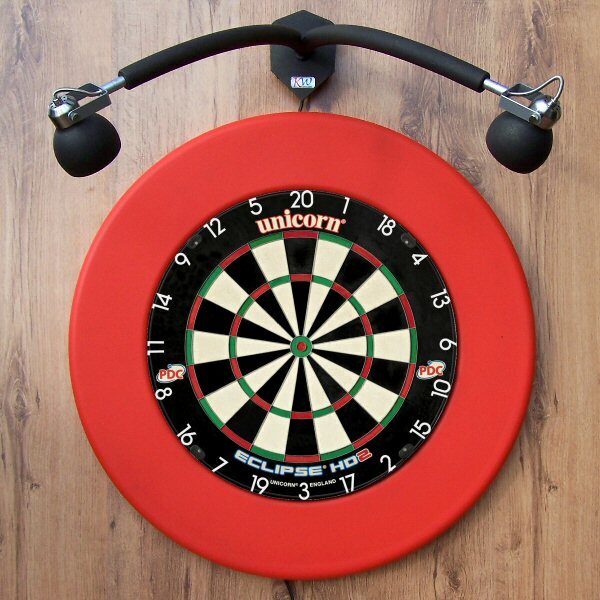 The lighting frame mounts on the wall and the arc and positon of the lights is designed to give an even clear light across the dartboard surface. There are several variation of this lighting system and these can be viewed on the manufactures website details below. Also see the Pro-Series on the Dartboard Lighting website. This lighting system meets the approval of the BDO and PDC. This is a purpose built spotlighting system I think many of you will enjoy. Tournament dartboard lighting is pretty standard but could be better, here is an example. The illustration shows the distribution of light, the bulb is focused on the twenty segment to the detriment of the rest of the board. This is normal practice but it clearly shows the limitations of using just one bulb to light the board. A basic setup is a single spot light either fixed to the wall, ceiling or dartboard stand. This type of set-up is most common in clubs and pubs. Are halo LED lighting systems approved for use by the BDO and PDC? I have been asked the question if the halo type lighting systems can be used for matches in particular local league games. I can confirm oth the British Darts Organisation (BDO) and Professional Darts Corporation (PDC) refer to LED lighting within their rules and can be used. However, please refer to their respective rule books as regards lighting. 'PDC' rules come under the Darts Regulation Authority (DRA). Details about lighting can be found on the Professional Dart Players Association (PDPA) website under DRA / DRA Rules / 5.6 Lighting. However, these rules do not cover local leagues. Most leagues use a version of rules set out by the BDO. However, the local rules may also cover additional items directly related to the league. Therefore, to make sure your local league dartboard lighting conforms to the local league rules you need to refer to the league secretary who should be able to provide you with the league rule book.